Home » Cell Phone » Will New York’s “Texting Zones” Actually Stop People from Texting and Driving? Will New York’s “Texting Zones” Actually Stop People from Texting and Driving? 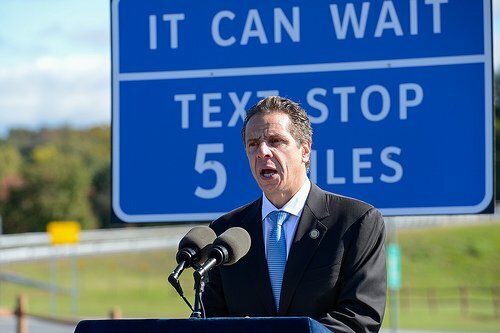 Last week New York Governor Andrew Cuomo unveiled his plan to re-brand 91 Park-n-Rides, rest stops, and parking areas along the Thruway and other highways as “Texting Zones.” The goal is to encourage drivers to wait until they reach one of these designated stops to send text messages, rather than texting while driving. New York State is continuing to use every tool at its disposal to combat texting-while-driving. In addition to tougher penalties, new detection methods for State Police and ongoing public outreach efforts, we are now launching special Texting Zones to allow motorists to pull over and use their phones. These Zones will be identified with signs along the Thruway and State Highways, reminding drivers that there is a nearby opportunity for them to legally and safely use their phone. With this new effort, we are sending a clear message to drivers that there is no excuse to take your hands off the wheel and eyes off the road because your text can wait until the next Texting Zone. These Texting Zones come as part of New York’s continuing efforts to make its highways safer. Studies show that texting while driving can make a car crash 23 times more likely, and New York is cracking down. In 2013, for the period between July 4th and Labor Day Weekend, New York State Police issued over 21,000 cell phone and texting-while-driving tickets. This is up from about 5,200 during the same period in 2012, an increase of 365 percent! New York also recently invested in a fleet of modified Chevy Tahoes that allow State Troopers to see into motorists’ laps—all in an effort to catch people who are texting while driving. Would you actually make use of a Text Stop if one was implemented in your area? Please vote in our poll and post your responses in the comments. Don’t forget to browse our site for more information on How to Fight a NY Cell Phone Ticket or download our Cell Phone Ticket eBook.